Spring is finally here! So despite the fact that they are calling for snow next week, I am going to go ahead and put on my “spring attitude”. As you know spring is a time of renewal and birth, of all things “so fresh, so clean, clean.” So you might have heard of something called spring cleaning, yeah? A time to look at our messy drawers, filled with old menus, receipts and random candy and put it all in a new box that we will sort next spring, maybe :). While cleaning our homes and closets is a wonderful idea, I think I can do you one better. How about we clean up our act this year? How about we start cleansing our bodies from toxins and our minds from mental clutter? How about we give ourselves and our families the gift of a healthy lifestyle? And to make it easy for you I will share the secret for success in this endeavor. Here it is… change your mind! That is it. While it can take time and effort to make lasting changes in our lives, it just takes one decision. If you want optimal health for you and your family, you have to make the choices that will take your there. And aside from the love in our lives, isn’t health the greatest gift since it allows us to enjoy that love fully? Think about all the nights you might have spent with your sick child, of all the therapies and pills a family member has had to endure because of a chronic condition and, I hate to bring this up but, about some one you have lost to a preventable disease. I have seen all this things in my family or families dear to me. I would like to say, no thank you! No, if I can help it. When we are very young we never think about health, we are just happy if we find a quarter under our pillows. In our teen years the only thing that matters is that nobody can understand us and most things aren’t fair. In our 20’s we are completely delusional, because we are indestructible :). Then when the dust starts settling we start seeing things that where not there before. While we, hopefully, leave our 20’s wiser we also begin to see the effects of all our previous choices. Our bodies put up with years of use and abuse from us, but at some point we are bound to crack. You might not think about these things now because you are healthy, because you are young or because you are used to the way things are. But believe me when I tell you our bodies can only fight an uphill battle for so long. And like they say in PR: “no es lo mismo llamar al diablo que verlo venir” (calling the devil and seeing him come are not the same thing) What I am trying to convey is that; it is easy to say that you will make changes later, that your child will eat better later, that you don’t have time or money, that “healthy people” just can’t appreciate a burger :), but think of all you have to loose if you miss your chance to make the changes that will lead you and your loved ones to a healthier life. So I am here to tell you, with all the love I can muster, you either take good care of yourself (and your loved ones) now by adopting a healthier lifestyle or you take care of yourself (or them) later with pills, expensive treatments, hospital visits, you get the idea. My friends, the sooner we start holding ourselves accountable for our choices the sooner we can get our of the hole we might be living in. No matter what your circumstances, your health, your social standing, no matter what life has handed you, you have to take responsibility for your life. If you believe, like in your teens, that life is just brutal and unbelievably unfair then you might remain in a circle of despair for a long time. Nobody wants that. So let’s get out of the cycle, let’s take charge and change our minds. Let’s do this together. For the rest of the month I will be focusing on small changes we can make, easy recipes, stress management techniques and all things that will leave us feeling so fresh, so clean, clean. 🙂 Stay tuned, stay healthy and stay positive! You can do it! Remember you can share your ideas or concerns on my facebook page! 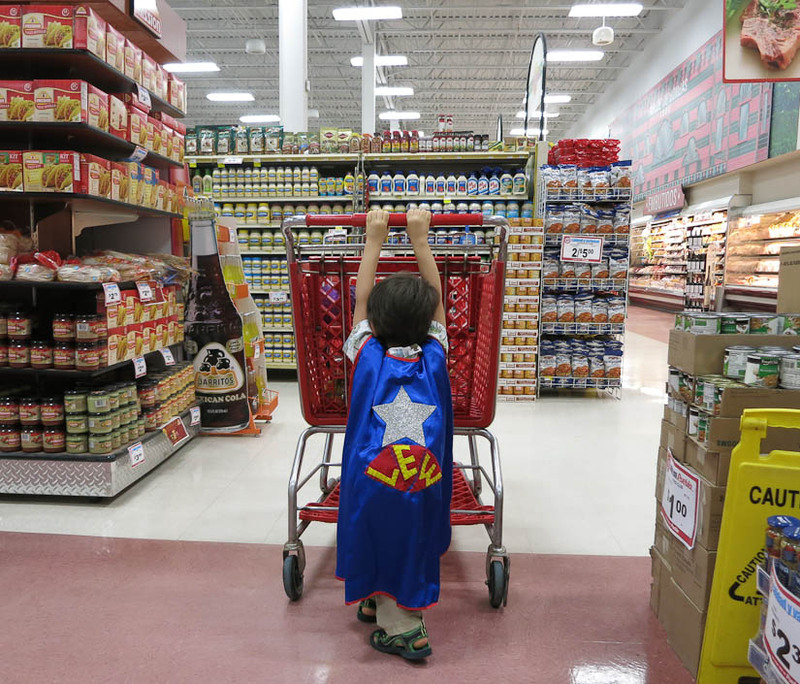 Super Lucas is ready for clean eating by avoiding the middle isles in the grocery store!